Last year, I created a Hot Air Balloon Photobooth for a sweet little girl’s birthday party. For her 2nd birthday, we wanted to continue the tradition – so we made a Floral Wreath background based loosely on her invitation. 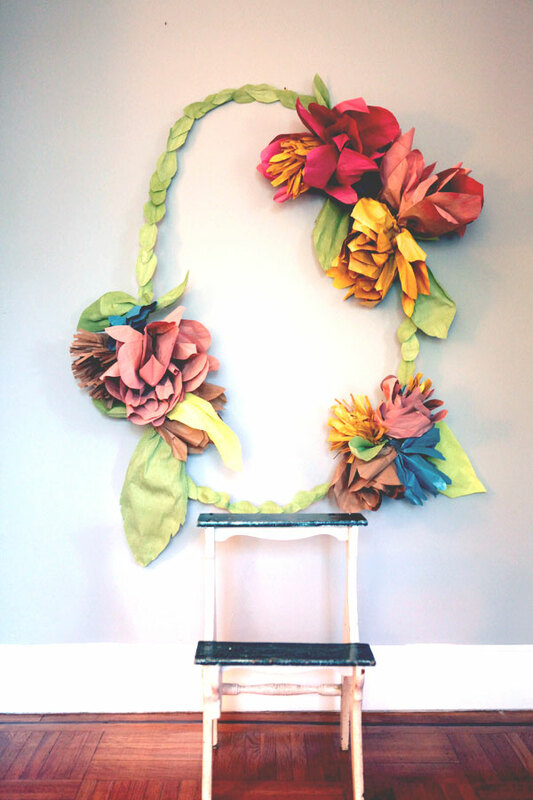 The best part – the flowers are made from brown paper lunch bags – the kind you get at the grocery store for 99¢. Step 1: Cut the top off a paper bag, making scallops with your scissors. Step 2: Flatten the paper bag, then fold it in thirds, to make a point. Staple the point and punch a hole in it. Step 3: Repeat with 3 more bags. Step 4: Overlap all four bags and staple the bottoms to each other so they make a long line. Gently bend them into a circle to create a flower. Fluff and manipulate the paper to give the flower some volume. Step 5: Thread wire through the holes at the bottom. (You may have to punch more holes to secure the wire). Step 6: Repeat this process to create 10 – 12 flowers. Experiment with different sizes and shaped petals (scalloped vs. pointed, or thin strips to create a ‘marigold’ or stamen shape). Step 7: Spray paint some of the flowers in a ventilated space. If you are combining colors, wait til they are completely dry to assemble the flower. 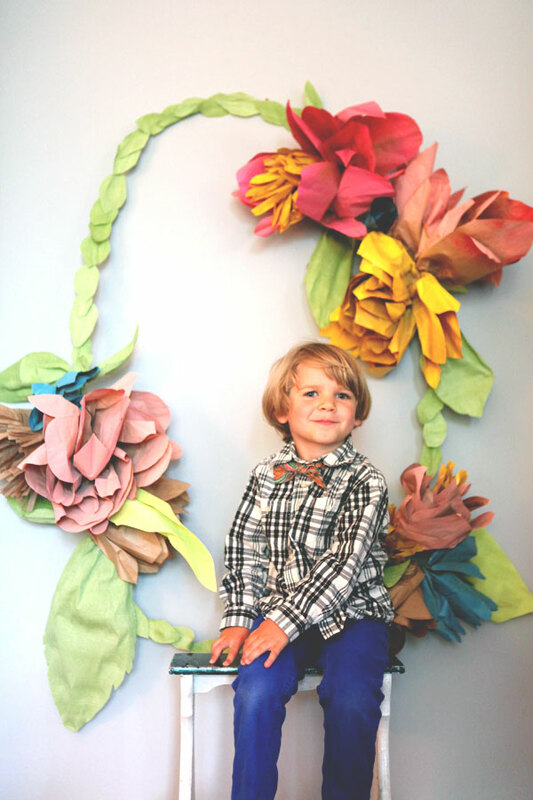 Step 8: Create 10 – 12 leaves out of crepe paper. I used these directions (slide 17 of 19 for leaves – size them up to be about 12 – 14 inches). Step 9: Form the 1/8″ aluminum wire into a giant wreath shape. Step 10: Cover the silver wire with green tape. 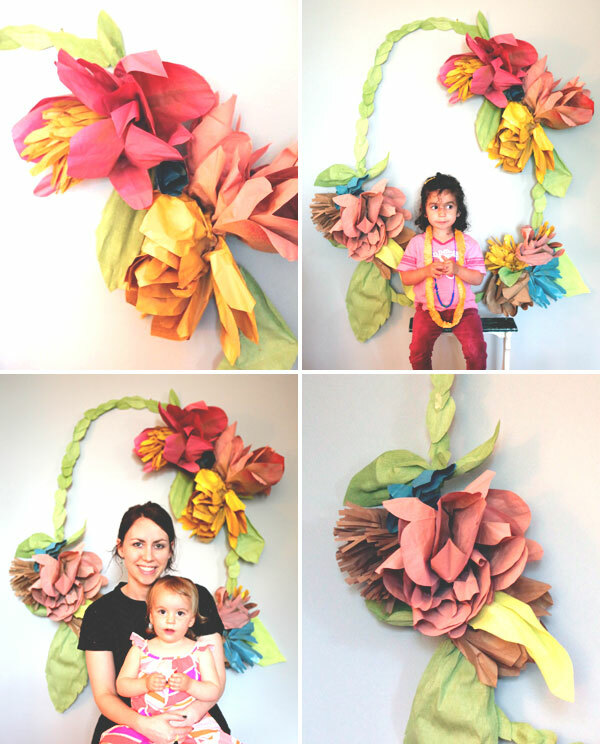 Step 11: Attach bunches of flowers and leaves to the wire frame using tape and thin wire. I chose to place them in three groupings – if you wanted, you could make triple the number of flowers and cover the entire frame. Step 12: Cover the exposed wire with 2-inch overlapping green crepe paper leaves, using tape. Step 13: Hang and enjoy! We took both digital and polaroids of the birthday girl, her family, and her friends. Everyone looked so cute in front of the wreath! Happy 2nd Birthday, Scarlet! Love this big impact back drop! Such a cute idea for Easter or a spring/summer birthday celebration! This is amazing and I can’t wait to try this. awww! that turned out totally awesome. great tutorial, chiara! i love the way the paint colors look a little muddy or softer on the brown paper bags. darling idea! that looks amazing! I would never be able to take it down! This is adorable! What a cute idea. Love the idea of spray painting the paper bags. aw this idea is so sweet! what a beautiful idea. love all the talented people on Oh Happy Day!